Bolted type cement silo is an enclosed tank storage of bulk materials, suitable for storing grain, cement, fly ash and other bulk materials. The parts of Aimix bolted type cement silos are manufactured by special laser cutting and drilling technologies The parts which are hung on automatic conveyor line, are painted in special painting cabinets. Then the parts of the cement silos are packed specially suitable for transportation. 3.It can be equipped level indicator so as to monitor the material level and amount. 4.With the screw conveyor, the materials can be conveyed to a certain position. 5.Suitable for loading into containers and exporting to overseas. 6.Perfect sealing assure its efficient working performance. Cement level indicator is a limit value indicator that is used to check the cement filling volume in the cement silo. This indicator is used to determine the maximum and minumum level of the cement in the cement silo by using of rotary motion. 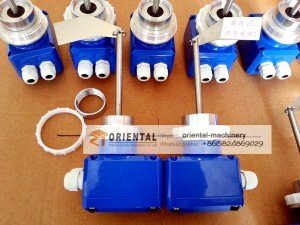 High pressure safety valves are used the discharge the high pressure in the cement silo. Those valves start to run when the pressure value reaches the pre-set pressure limit value. Those valves are the equipments that keeps the pressure in the cement silo in desired values and prevent the cement silo filter from breaking down. Fluidizing system involves distribution pipe and nozzles. Distribution pipe is assembled into cement silo by fixing parts that are pre-assembled in to the cement silo. This system makes the cement in the cement silo bloated out. The advantage of this system does not harm the metal structure of the cement silo like the systems with vibrators do. The Cement Screws are used to transfer the cement from big bags and bags to cement silo and cement batchers. Cement screws are manufactured by Elkon in different capacities and diameters by using latest technology. • Complete replacement of filter media by only one person within a few minutes.